With the milder weather on its way, ‘tis the season for a food festival! These are one of our favourite types of event to cater for as the atmosphere is always electric with people there wanting to have a good time and try new things. Hog Roast Redcar were asked, along with another dozen or so food vendors and craft stalls, to cater for the locals at their spring dining club event in the park. As it was such a vast open space, part of the park was sectioned off and there was a small fee to enter the designated area. Running in the afternoon from 12-6pm, the event was open to all ages so there was a nice balance of families and groups of friends around, trying all there was to offer. What is more, THE SUN CAME OUT! The British weather had finally shown us some kindness! We weren’t sure upon arrival how the day would pan out as we were one of the first vendors to arrive and there was an almighty frost first thing. However, we were all very lucky and realised that had the weather turned, it would have been a very different scenario. Due to the wide demographic of the attendees expected, we opted to provide our classic slow-roasted hog served in a roll or wrap along with a selection of homemade sauces. 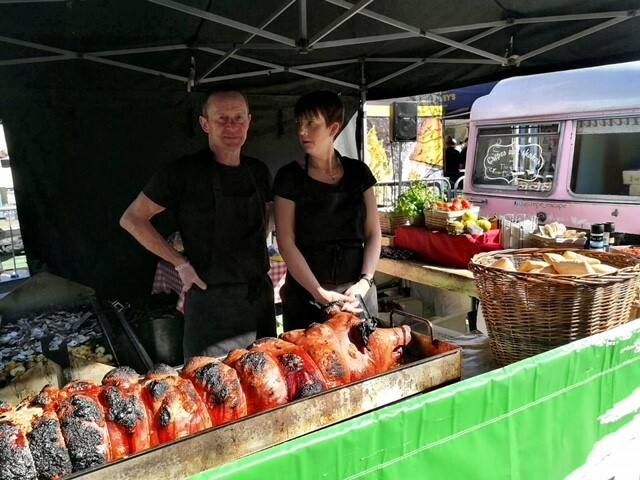 When providing for a large number of customers and with only a couple of members of staff, this option was an excellent choice for Hog Roast Redcar as we were able to serve people quickly and efficiently without sacrificing the quality of our product. Plus, the pig is always a visual crowd pleaser, presented and cooked on our Hog Roaster machine. Food festivals generally achieve a decent footfall and therefore we were able to promote our business on a great platform. We consistently had a crowd at least four deep at the counter, with minimal waiting time and the customers appeared to be very happy with their purchases. A very well organised event with all taste buds catered for across the festival. Hog Roast Redcar would love to return!